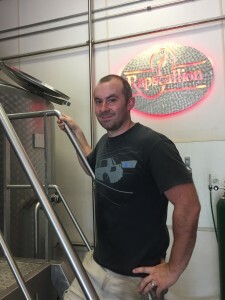 A Q&A with Rapscallion Head Brewer Jonas Noble about the evolving Mk IPA series. What inspired the series? So my first thought in developing a new IPA was to find a simple way to name/number them while in the development stage. Since we have decided here to keep our beer names short and to the point I went with a term used by manufacturers to number new models. “Mark” is defined as a particular model or type of a vehicle, machine, or device. In other words when something is redesigned, improved or changed, it can be the new mark or mark 2 and so on. The term was actually used in the recent Marvel “Iron Man” movies as well distinguishing the different, evolving suits. 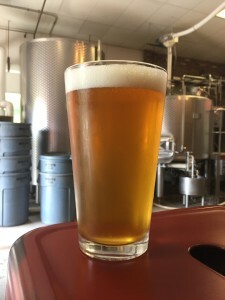 Ever since we started at the Sturbridge brewery location there never has been a flagship IPA. We have experimented with lots of types of IPAs but never an everyday IPA. When a new beer is developed I think it should be developed with the customers and we have such a diverse group that comes in all the time. They are the best test kitchen I could ask for. Tell us about each beer and how the recipes for each informed the others. The base beer on Mk1 – Mk4 was the same with some minor changes. The most significant variable was the hops. I tried different combinations and quantities, factoring in customer feedback. Mk5 has taken a different route with a different base beer utilizing the hop combination from Mk4. To be a great recipe I think it must evolve and change until its just right. Ba by steps, as they say. What has been the feedback on each of the beers so far? Anything surprising, or has it aligned with your thoughts? I think it has been very positive. They all sold out faster than we could imagine. I think ultimately it’s about what the customers want so I’m doing my best to really listen and apply the feedback. How many will there be in total? As many as it takes to choose one and continue the series to experiment. So, will there eventually be one that will be added to our mainstays and stick around? And would you start a new series of “Marks” then? My idea is to eventually have our house IPA and continue the series as an experimental venue. These are your first new beers as head brewer other than Winterfest. What ideas are bouncing around in your head after experimenting with these new recipes? Well there are so many interesting ingredients out there to try and this series is an avenue to try them. Maybe a new hop, yeasts, different base beers. It will turn into an experimental IPA series that should be fun for me and more fun for the customers to try. As much as I like flavorful hoppy beers I’m fascinated lately by beers like Pilsners and Lagers. Are there any plans to introduce a new pilsner or lager at any point? I hope to have a seasonal Lager program in place within the next year. Having Harvard Lager on all the time but paired with a Pilsner, Oktoberfest, Dark Lager, India Pale Lager and so on based on the season. Beer is as much of an art as it is a science. There are definitely lots of neat things to come!